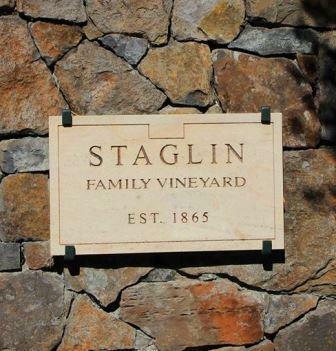 The modern era for Staglin Family Vineyards begins in 1985 when it was purchased by Garen Staglin and Shari Staglin. However, the roots and history of the vineyards makes it one of the older vineyards in Napa Valley as it dates back to the days of the Civil War period. The original vineyard was cultivated in 1864 by John Steckler. In 1864, the vineyard was part of a much larger, 367 acre estate that the Steckler family bought from Serranus Hastings for $34 an acre. They began planting their first vines in 1865. The Steckler family built the original farmhouse on the property. The Steckler family sold the estate in 1904. In 1963, the property was purchased by the Sullivan family. The Sullivan family were related to the founders of Beaulieu Vineyards, the de Latour family. That explains how they knew to ask for help in planting vines and wine making from Andre Tchelistcheff. At the time, the harvest was sold to Beaulieu Vineyards for use in their Georges de Latour Private Reserve bottling. In 1985, the estate was sold to the Garen Staglin and Shari Staglin. As part of the terms of sale, the family agreed to continue selling part of their harvest to BV Vineyards until 1994. Staglin Family wines made their debut with the 1986 vintage. They soon brought in David Abreu to help with their farming and vineyard management. Under the guidance of David Abreu, they completely replanted their entire vineyard starting in 1987. In 2007 the Staglin family purchased the original Steckter home that was once part of the original vineyard. That same year, Staglin became one of the first, Napa Valley vineyards committed to using only solar power for all their electric needs. They did this by adding a 164-kilowatt photovoltaic array that generates enough power to keep their property electrically self-sufficient. Staglin owns 61 acres of land with 51 acres cultivated with vines in Napa Valley. The vineyard is in a prime location on the Rutherford Bench. They have vines that are situated close to, or are adjacent with Scarecrow, Inglenook, and the Bella Oaks vineyards. In fact, the Bella Oaks vineyard, which was a major source of grapes for Heitz Vineyards, is now used by the Staglin family exclusively since 2012. Staglin Vineyards has a terroir of rocky, volcanic soils, with gravel, rocks, stones and clay. All of their farming is done using only 100% organic farming techniques. They began using organic farming methods in 1990, and earned their certification from the CCOF in 2005. Staglin Salus wines, which made their debut in 1999 are made with purchased fruit. All other Staglin Family Vineyard wines are made from only estate grown grapes. While the Staglin family has employed a plethora of wine makers over the years, some refer to as a game of musical chairs, Michel Rolland has remained as their consultant. Staglin Booth Bella Oaks takes its name from the partner of the Staglin family and the Booth family. The Booth family purchased the famous, Bella Oaks Vineyard in 2012. As the Bella Oaks Vineyard and the property of the Staglin family are only 1 vine away, it was a natural fit to begin producing the wine together. The Staglin Family Vineyards Cabernet Sauvignon wines are vinified in a combination of stainless steel tanks, concrete vats and French oak barrels. On average, the wines are aged in 90-100% new, French oak barrels for about 22-24 months, before bottling. Staglin Family Vineyards is best served at 15.5 degrees Celsius, 60 degrees Fahrenheit. The cool, almost cellar temperature gives the wine more freshness and lift. Young vintages can be decanted for 1-3 hours, depending on the character of the vintage. This allows the wine to soften and open its perfume. Older vintages might need very little decanting, just enough to remove the sediment. Seavey is best served with all types of classic meat dishes, veal, pork, beef, lamb, duck, game, roast chicken, ribs, hamburgers, barbecue, roasted, braised, grilled dishes and stews. Staglin Family Vineyards is also good with Asian dishes, hearty fish courses like tuna, salmon, mushrooms and pasta. The white wine of Staglin Family Vineyards is best served with all types of seafood and shellfish, sushi, sashimi, chicken, veal, pork and cheese. Lush, plush, rich, ripe, fat, round, opulently textured and delicious. The wine serves up a blast of ripe, sweet, black and blue fruits, vanilla bean, licorice and smoke. Full bodied and intense, this velvety wine is already hedonistic and should be even better in a few years. The wine was made using a blend of 87% Cabernet Sauvignon, 10% Cabernet Franc and 3% Petit Verdot. Stone, citrus and buttered pineapple scents open to a soft, fat, open, spicy, citrus filled wine. Aged in 50% new, French oak for 11 months, of which 8 of those months were spent on its lees, this Chardonnay can be enjoyed on release. Golden yellow in color, honey, floral, melon and citrus aromas open to a sweet, tropical and citrus filled wine that is a bit hot on the finish. Blending 91% Cabernet Sauvignon, 6% Cabernet Franc and 3% Petit Verdot, the wine offers truffle, blackberry jam, spicy cassis, coffee bean, smoky oak and vanilla scents. In the mouth, this lush, fat, polished, wine delivers sweet, ripe, black cherry liqueur with cocoa. Aged in 95% new, French oak for 22-24 months, this forward styled Cabernet Sauvignon is already delicious. From a blend of 88% Cabernet Sauvignon, 8% Cabernet Franc and 4% Petit Verdot, the wine opens with coffee bean, jammy plum, incense and burnt maple sugar notes. Lush, textures and a tasty, sweet, plum liqueur and cassis finish are the hallmarks of this wine. Jammy blackberries, mineral and spicy cassis open to a spicy, tannic, Caberent Sauvignon that will show much better after a few years of bottle age. Combining ripe, plush, juicy, dark berries with licorice, chocolate and coffee, this opulent treat is not an over the top style of wine. It's fresh, rich, concentrated, plush, harmonious and balanced. I really like this style of Cabernet Sauvignon.